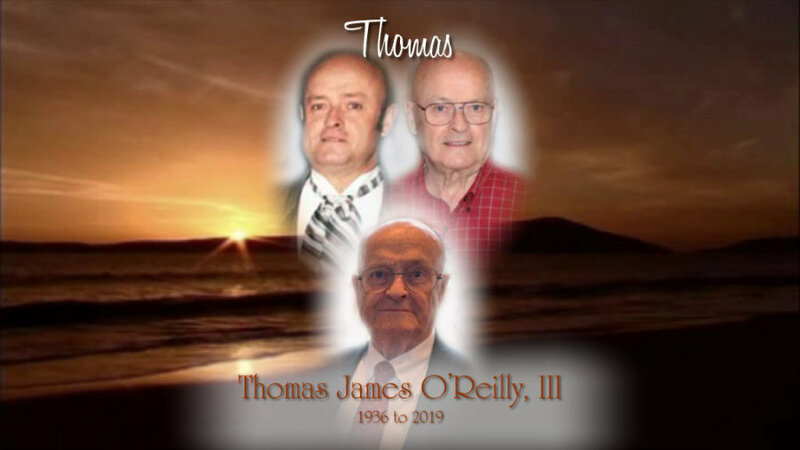 Obituary for Thomas James O'Reilly, III | Kenworthy Funeral Home, Inc.
Thomas James O’Reilly, III, 82, of Hanover, PA, and formerly of Long Island, NY and Palmyra, VA, entered God’s eternal care, Tuesday, January 22, 2019 at his home with loving family by his side. Born April 17, 1936 in Manhattan, NY, he was the son of the late Thomas J. and Edna S. (Hughes) O’Reilly. Thomas was the loving husband of Patricia R. (Coffey) O’Reilly with whom he shared 61 years of marriage. Mr. O’Reilly was a 1954 graduate of Long Island City High School, Queens, NY. After graduation, Thomas enlisted in the United States Army having served his country proudly during the Korean Conflict. After serving in the US Army, Thomas became a police officer with the Port Authority Police of NY and NJ. On January 10, 1992, after 32 years of service he retired as a Detective Sergeant. Thomas also attended the 128th session at The Federal Bureau of Investigation, United States Department of Justice where he completed a course of instruction afforded by the FBI National Police Academy, United States Department of Justice at Quantico, VA.
Mr. O’Reilly was a member of the Port Authority Police Emerald Society, where he was a past President and a Marshall at the New York St. Patrick’s Day parade for the PAPES. Thomas is also a life member of the Lake Monticello Virginia Fire and Rescue Squad. In addition to his loving wife, Patricia, Thomas is survived by his daughters, Barbara A. O’Reilly, Debra L. O’Reilly, Caroline R. Slabowski (George), and Kathleen P. Foley (Jason); 8 grandchildren, Brenda Sterenchock (Brian), Michele Domingo (David), Sarah Van Zandt (Nathan), Melissa Slabowski, Thomas Slabowski, Karen Slabowski, Rowan Foley, Reilly Foley and 7 great grandchildren. He was preceded in death by two brothers, George R. and Richard H. O’Reilly. A service to celebrate and remember Thomas’ life will be held 12 PM, Wednesday, January 30, 2019 at the Kenworthy Funeral Home, Inc. 269 Frederick Street, Hanover, PA 17331. The family will receive friends at a visitation from 11 AM to 12 PM, on Wednesday, January 30, 2019 at the funeral Home. The Hanover Allied Veterans Burial Detail Honor Guard will provide Military Honors. In lieu of flowers, contributions may be made to Chronic Lymphocytic Leukemia (CLL) Society, P.O. Box 1390 Claremont, CA 91711 or Port Authority PBA Widows and Children’s Fund Inc. C/O Port Authority Police Benevolent Association, 611 Palisade Avenue, Englewood Cliffs, NJ 07632-1805.